Home Blog Considering A Replacement Garage Door? Considering A Replacement Garage Door? We usually only advise replacing your door if it is beyond repair or your door is fairly old and you after an upgrade. If the maintenance and repair costs are creeping up every month, then it usually ends up becoming more cost effective to replace it. 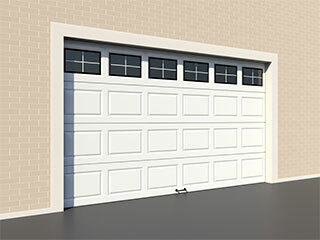 There are various types of garage doors on sale in the market. Not all of them are going to be compatible with your garage or residence. Some of them may not appeal to you visually, while others may not have the functionality that you require or desire. Generally speaking, there are mainly two broad categories of doors for you to choose from. These are tilt-up doors and sectional roll-up doors. The latter is more expensive, but there is a good reason for that. Tilt-up doors are manufactured from a single panel. The sectional roll-up doors comprise of several horizontal sections. This offers a certain degree of flexibility that you cannot enjoy with tilt-up doors. The types of garage door available extend beyond functionality differences. The manufacturing material varies - there is an extensive list of options to choose from. Wood is an affordable and attractive option. However, wood may not suitable for colder clothes likely to receive significant rain or snow. If you are looking for something more durable, then you could opt for steel. This type can prove to be more expensive but considering the durability, it would be a great investment. Garage doors can also be made of aluminum or fiberglass - to find out more about the materials available to you, just contact our team. We'll be happy to guide you towards the right one for you. If you are definitely planning to replace your old garage door with a new one, then it's always a good idea to consider your safety needs. Do you want a door that is equipped with technologically advanced, safety features? Do you want to control your opener from wherever you are with your smartphone? Consult with our replacement technicians for a full run through of the modern safety functions now afforded by current openers. Our experts at Garage Door Repair Dallas are here to help you! For more than ten years, our company has focused on delivering excellent quality services for our local customers. Whether we’re fixing broken springs or installing a brand new door, we want you to be completely satisfied with our work. Our tightly-knit team can fix any problem you’re dealing with. Check out our online scheduling system to see how you can easily book an appointment. When you hire Garage Door Repair Dallas, you get the best service, the best products and the best results on every call! Our technician will contact you before arriving. Until then, feel free to browse our website! Garage Door Repair Dallas is at your service!